Virtually eliminating torsional friction by incorporating a bearing mounted stationary anvil. 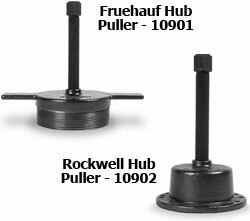 The Fruehauf & Rockwell hub puller, generates up to 25,000 lbs. of force which remove even the most difficult seized wheel hubs. Ensure the hub threads are in good condition, clean and free of debris. Thread the tool into the hub by hand using the two tabs on the side of the tool. If the tool will not thread in by hand, check hub threads for damage. Using the bolt which fastens the cap onto the hub, secure the hub puller to the hub. Do not over tighten. Once the wheel assembly has been removed, detach tool from the hub, and repeat on the remaining hub(s).